Soak the bread in water to cover for 3 minutes. In a food processor or high speed blender, drop the garlic and onion and chop it. Add the tomatoes, bell peppers and parsley. Process until mixture is well chopped but not completely puréed. Add cucumber and pulse until it is chopped but still chunky. Add olive oil, vinegar, salt and pepper. If the soup is quite liquid, squeeze the bread out with your hand and add to soup, process until just combined. The bread can be omitted if preferred. Adjust seasonings. Garnish with avocado if desired. Serve chilled. In a small bowl, combine the cold water and gelatin and let soak about 10 minutes without stirring. Meanwhile, in a medium saucepan, heat the cream. When it is very warm but not bubbling or scalding, add the 1/2 cup of the rose petal jam and the vanilla extract and stir well to dissolve. Turn off the heat and add the gelatin mixture, and stir again to dissolve. Pour the mixture through a sieve, then into 6 wine or martini glasses and chill, uncovered, 2 hours. To serve, place a dollop of the remaining jam on each panna cotta. If you can find organic roses, put a rose bud on top of each. Clean and slice green onions thinly. Sautée gently in butter with salt and pepper until soft, about 5 minutes. Add the lettuce. Sautée until soft, about another 5 minutes. Add the peas. Barely cover with water and bring to a boil. Immediately turn down to a simmer and, if using fresh peas, cook until just tender, 3-5 minutes. If they are frozen, bring the soup to a boil and immediately turn it off. Purée in blender, leave a little chunky. Return to heat. Add cream and mint, adjust seasonings. Don't continue to cook it or it will lose its color. Serve immediately with a garnish of yogurt. Also great chilled. Dice the tomatoes small and toss with the oil, thyme, salt and pepper. Let the mixture sit for a good 15 minutes. Grill the olive bread on both sides, no oil needed. Divide the tomatoes on top of the bread and eat immediately, with a glass of red wine. Preheat the oven to 375F. Toss ingredients together. Roast for 20 to 25 minutes. Trim the roots from the ramps and brush or spray them with the olive oil. Salt and pepper them. On a grill or stovetop ridged griddle, cook the ramps for about 5 minutes, turning once. Preheat the oven to 350F. Cut the core out of the tomatoes, turn them over and give them a quick squeeze to remove some of the seeds. Cut a “lid” off the garlic bulb at the pointed top. Put the tomatoes and the big part of the garlic into a baking dish and drizzle with 2 tbsp of the olive oil. Salt and pepper them and roast for about 1 hour, until they are caramelized and fragrant. Let cool completely. Take the raw bits of garlic out of the remaining part of the bulb. Toast the almonds in a dry fry pan over medium heat, shaking the pan constantly as you would if you were making popcorn. Let them cool completely. Drip the raw garlic into the food processor while it’s running. Add the tomatoes, almonds, chile, a teaspoon of salt, and squeeze the roast garlic into the bowl, discarding the papery skin. Process until smooth but still textured. With the processor going, drizzle the remaining olive oil in a stream, as you would a mayonnaise. Add the white part of the bread and the vinegar and adjust seasonings. Store in fridge. Bring the milk almost to a boil over low heat in a medium saucepan. In an electric mixer, beat the egg yolks with the sugar until they become aerated and lemony in color. Add the vanilla. Whisk in half the hot milk and return that to the saucepan with the rest of it. Heat on low, stirring constantly with a wooden spoon until it thickens slightly. The custard should coat the spoon and, if you draw your finger on the back of it, it should leave a clear trail. Immediately remove it from the heat, put it in a bowl and let it cool. Whisk in the scotch. Beat the egg whites in the bowl of a super-clean electric mixer. Add the sugar gradually, letting the whites absorb it bit by bit. Add the vanilla and beat until the meringue is glossy and holds stiff peaks. Bring a pot of water to boil and turn it down to a gentle bubbling simmer. Drop tablespoons of meringue onto the water and poach them, turning once, for about 2-3 minutes. It works best if you give them a lot of room and use an oval shaped spoon. They will expand while cooking, but get smaller again when removed. Put the sugar in a small heavy pot with the water. Pot should be super-clean. Swish the sugar with the water around so it is distributed evenly. Bring it to a boil with the heat under it, not coming up the sides of the pot. Keep a watch on it - it will first become a slightly yellow bubbly syrup, then a more golden one, then a dark brown caramel. As soon as it gets darker, remove from the heat. Put some of the custard sauce in the bottom of 6 individual bowls and distrubute the meringue "eggs" on top of it. Drizzle the caramel while hot, with the tines of a fork. Serve right away. Preheat the oven to 475F. Combine well the maple syrup, soy and cayenne. 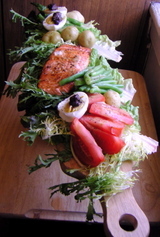 Dry the salmon with a paper towel and place in a baking dish. Thoroughly coat the fish with the glaze and bake in the oven for about 15 minutes. It is traditional and delicious to let it be rare inside. Let cool completely. Steam the potatoes until tender but still somewhat firm inside, about 15 minutes. Let cool completely. Steam the green beans until they are barely cooked and still very crunchy, about 2-3 minutes. Let cool completely. Whisk together the mustard, vinegar, and olive oil and season to taste. 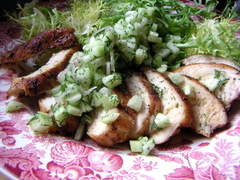 Compose the salad on a platter of greens and drizzle it generously with the dressing. Peel and dice the cucumbers small. Cut the shallot in half and slice as thin as possible. In a glass or ceramic bowl whisk together the rest of the ingredients and add the cucumber and shallot, tossing lightly. The salsa needs to be served soon after making it and doesn't refrigerate well. Serve on grilled fish or chicken breast, as above, which was sprinkled with salt, black pepper and cayenne, then sauteed in butter. Roll out the pastry and line the tart pan as usual. Preheat the oven to 375. Refrigerate the shell for 20 minutes and line it with parchment paper and about a pound of dried beans. Bake it for about 15 minutes near the bottom of the oven. Take out the beans and let it cool while you mix the remaining ingredients together with a whisk. Turn the oven down to 350F. Pour filling into the shell and bake until it is set, about 20 minutes. Let cool completely. Rinse, trim and slice the Sprouts thinly. Heat a heavy pan, add the butter and cook the sprouts over medium heat, stirring regularly with a wooden spoon. Season with salt and pepper to taste. Turn the oven on the 375. Rinse the sprouts, dry them and trim the stems. Cut them in half lengthwise so each half has a bit of stem holding it together. In a roasting pan just big enough to hold the sprouts in a single layer, melt the remaining ingredients together. Add the sprouts and stir well to coat them with the mixture. Roast for about 25 minutes, stirring occasionally, until tender and starting to brown.